A last Hong Kong breakfast in a typical coffee shop in Wanchai, the Chung Hing Restaurant on Hennessy Road. Hot lemon tea gets us going while we decide what to order. We feel the need for something substantial, hot and soupy. While we were having breakfast, the place became packed later with workers getting an early lunch. The coffee shop specialises in bbq so we assume they would do a bbq pork noodle soup, silly us. They don't but they happily whip one up anyway using Maggi instant noodles. DonnaChang has a fascination with Asian manufactured meat products, particularly sausages, so she has a spicy pork and luncheon meat soup. She loved it. It was like a porky spaghetti ragu sauce mixed with noodles and a strange sausage. Coffee shop exterior. Most of the coffee shops we went to did a roaring trade out the front selling takeaway or baked goods. Waiting for the ferry to Macau we have some Japanese at Ajisen Ramen, a chain that also has a couple of outlets in Sydney.We're not that hungry but can't miss an eating opportunity. We start with some spicy sea welk, certainly not on the menu in Sydney. Chewy. A tonkatsu ramen with standard fixins. Nice tea smoked egg, but too hard boiled. The broth was ok and the pork roasted nicely. A different pork style ramen, with large thin strips of pork roast and a milky broth. Mango Fleecy - a cold icy mango cordial in a wine carafe. We're picked up from the wharf at Macau by our mate Machu Picchu who is living the high life as a project manager as part of the Cotai strip's casino building frenzy. He gives us the traditional Australian greeting of a firm handshake a cold beer. As we try a variety of China's finest frothy beverages, the view from Machu Picchu's unit is amazing. Now this is high density living folks, welcome to the future. Notice in the space where there is no highrise they are building another. We wander out for an evening stroll. A little of ye olde Portuguese Macau remains such as this lovely square, a nice spot for some more lagers. Some puddings which we didn't have the stomach capacity to try, apparently a specialty of Macau. Pudding, beer and smoke shop. All the essentials. Ye olde Portuguese alley way. DonnaChang and Machu Picchu discussing the excruciating minutae of life on the way to the Old Taipa Tavern, an expat bar where they don't serve Chinese beer, so we have to temporarily switch to Carlsberg. The eating frenzy begins. Big fresh bread rolls, decent bread is one of the few things we miss in Asia where bread is usually super refined and sweet. Butter as well - no Blue Band (evil long life margarine popular throughout Asia) here. Onion and tomato salad starter, so refreshingly simple. Clams, how I love you. My first ever serve of good chorizo sausage, now I understand what all the fuss is about. Some fried rice portuguese style, as you do. I'd never had good Portuguese chicken until this baby, so smokey and divine, with chips too! A very small sample of the beers drunk throughout the evening, which took us through various casinos, we're not gamblers but the casinos are a hoot to drink in. The night ended in the type of bar where the ladies are extra friendly and come from strange parts of the former USSR. 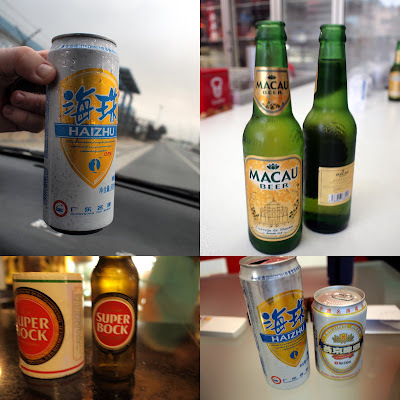 Macau is a fine place for a lager frenzy. Love your pieces. If you're ever in Hong Kong and want to get off the street for the evening go to Yin Yang in Ship Street Wanchai and tell Margaret Xu Yuan that Philip sent you and have her tasting menu. Sure it'll set you back a high end Sydney $AUD100pp, but she's a fantastic chef, and you'll eat food from her two organic farms and stuff she forages. Sounds earnest but it ain't. Like the very first thing we had was her own stoneground tofu, a big cube each in a shrimp roe and lavender flower sauce. Then about fifteen other things including a whole roast chook with a wild ginger and garlic dipping sauce. Makes a change from Macs noodles. And ask her where she eats: she'll send, or take you to street places no gweilo could ever discover. We'll be passing through next year and might give it a try, we like the sound of that.